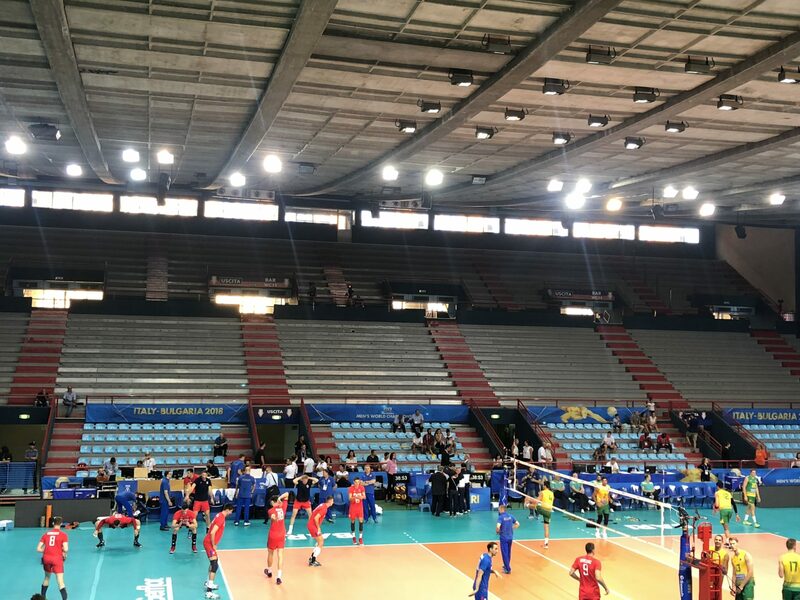 After 2 of the 5 preliminary sites of the 2018 FIVB Men’s Volleyball World Championships opened on Sunday to rave reviews, reports have not been as rosy on Wednesday from Bari, Italy, where 6 nations began play in Pool C of the tournament. There, the 5,080 seat PalaFlorio is hosting Cameroon, Tunisia, Australia, Russia, Serbia, and the United States. Cameroon beat Tunisia 3-0 in the opener, while Russia is currently en route to a win over Australia. The United States and Serbia will finish day 1. Observers have reported to VolleyMob that they would not deem the facility adequate for even a “World League group 2 match,” referring to the second tier of the prior annual World League tournament. The event is home to a number of sporting events, showing the Italian Masters Championships in badminton, professional basketball scrimmages, and local martial arts competitions on its upcoming schedule. But its duties are rarely of the caliber of the hosting of the World Championships in what is a major sport in Italy. It also hosts a number of concerts. It is also scheduled to host the Final 4 of the Italian Men’s Volleyball SuperCup in January. The venue feels out-of-place next to Italy’s other hosting venue, the Nelson Mandela Forum in Florence, which is spacious and has all chair-back seats. The PalaFlorio was opened in 1991, and was closed for 5 years in 2003 due to problems of building maintenance. It was then reactivated in 2008 and made accessible and brought up to code before being opened in 2010. The venue is named after former Italian Volleyball Federation president Pietro Floriano Florio, who served as head of FIPAV from 1977 to 1978. The official list attendance for Cameroon vs. Turkey, the day’s opener and least-internationally-interesting match, was 1,200 spectators, though the later matches seem to have attracted bigger crowds. The city of Bari is in southern Italy (near the heel of the ‘boot’) and is home to 326,799 people.